When baseball is healthy, the country is healthy. If there comes a day when baseball dies, I am not so confident America will not die with it. Why? Because wrapped up in baseball are the humanizing elements of American life: family, community, neighborly associations, and the leisurely enjoyment of completely useless beauty. If there are temptations particular to this country, they involve forgetting the virtues and transcendent values that give baseball its great meaning. In the face of a philosophy of life that is defined by the chase after material consumption and utilitarian success, baseball tells us to slow down and simply rest with our neighbors in the appreciation of something beautiful. In an age of mobility and rootlessness, baseball is a place of local attachment and community loyalty. While the internet and mass media have brought us a sense of placelessness and reduced us, in some ways, to anonymous consumers of a uniform pop culture, baseball points to an identity rooted in our real relationships with our neighbors and the places that raised us. Baseball, then, is a sign of the saner parts of the American soul. It stands as a bulwark against some of the dis-integrating forces of our time, whereby true leisure and friendship take a backseat to production and consumption, and where real, given attachments to community are replaced by disconnected, online conformity. If we can retain the poetry and community of baseball, maybe we can rediscover it elsewhere, too, and so begin the work of re-knitting the social fabric that keeps this country and its people from dividing and breaking asunder. 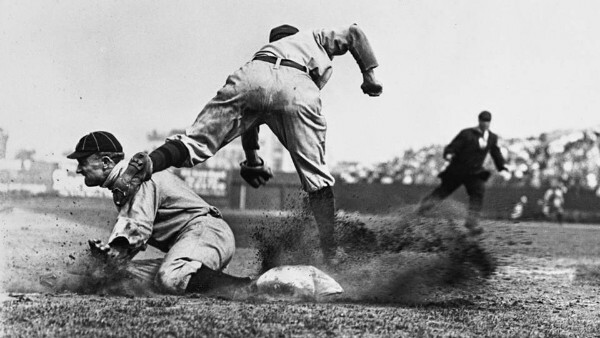 Ty Cobb sliding into third base, 1910. 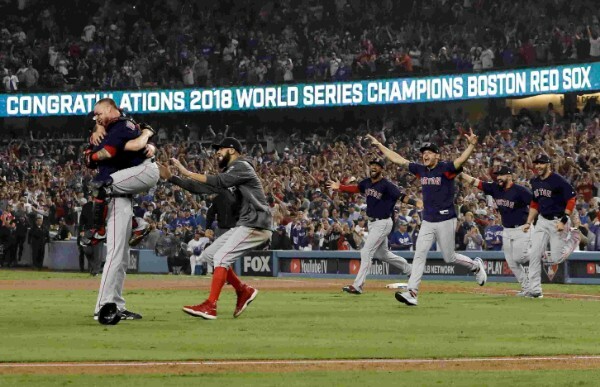 It would be easy to draw a parallel between baseball’s place in America and the place of the Bread and Circus sports of ancient Rome, given that Americans are so fond of finding similarities between our republic and that antique one. The two sports, however, could not be more different in their social role. The gladiatorial contest appealed to the people’s animal appetites for violence and it was intended to distract from an ailing empire. Baseball did not arise among decadent decline, but as a neighborhood pastime in the heart of optimistic, peaceful farmland somewhere in the Northeast of the country, and people love baseball, not as an idle distraction for the senses, but, I would contend, for its poetry. By poetry I mean the way in which the beauty of the game holds a depth of meaning for us. Poetry is the way something beautiful resonates with meanings and memories; it is found where our appreciation of one thing blends into appreciation of all sorts of others. The object of our appreciation resonates with a thousand other things besides itself, and this is why, for so many, the game is more than just the game. Baseball is supremely resonant for the American soul: it is neighborhood kids, wiffle ball in the cul-de-sac, and catch with Dad; it is Fourth of July fireworks and easy summer nights; it is the great American novel acted out in ash wood and leather. Friendship and familial bonds and the dance of the community enter the pattern of the game and rest therein. Wherever we encounter poetry, whether in nature, in music, or in sport, we are lifted out of the normal workaday flow of time with its anxieties and plans. Baseball is particularly good for this: the sanctuary of the diamond operates on its own kind of time that is measured in runs and outs and not minutes. The very pace of the game and the epic length of the season are invitations to contemplation and reflection, and they give space for the unfolding of timeless narratives. When we enter the rhythms and patterns of the game, the pull of daily worry drops away and the leash of daily duties goes slack. The aperture shifts our focus towards community, the loveliness of the game, and all that these represent and stand for. This is why the game provides that valuable check on the anxious impulse to climb the ladder and prove oneself by wealth and career success: poetry, music, and baseball are ultimately done for their own sake, and not for some external profit. They are not about grasping and taking, but about standing back and appreciating. I’m being a bit idealistic, maybe, but I don’t find anything so objectionable in describing a thing in its perfect and pure form, and if no ballgame is perfect, still none is so humble that it fails entirely to participate in these spiritual pleasures. Wrapped up in the game is a great deal that is fine and worthwhile in an imperfect people and an imperfect land. And there is another gift that the game’s poetry gives to those who enter into it. In the confines of the ballpark, partisan affiliations are shed like winter coats and profession and wealth become nigh indistinguishable, as rich and poor alike don the same cap and the same team colors. Our fights and squabbles lose significance before that which remains untouched by the petty concerns of the passing hour: the game. I remember being at the Minnesota Twins’ ballpark in the midst of a hotly contested state referendum vote (one which had brought a tenseness to the veneer of Minnesota Niceness). But here, in the oblong field, we were neighbors again, and the only enemy were the Toronto Blue Jays. What’s more: in baseball, unlike in politics and ideology, the generous rule of sportsmanship reigns above the proceedings, and mandates that even enemies embrace, when all is said and done, as brothers. It’s awfully hard for us to conceive of ourselves as neighbors to 330 million people—we develop neighborly loyalty for those among whom we really live, and with whom we really deal. One of the reasons our government was designed federally was to counteract the great size and reach (even then) of our country by building on successive levels of community, where authority begins at the smallest and most personal level. Federalism was settled on by the framers of our political system as a means of dispersing power so that it could not be abused, of giving people local authority over what they knew best, and as a way of ensuring that the government can be run on the interplay of real human communities and human relationships and not on the imposition of ideological abstractions or powerplays from afar. If a country as vast as our is to continue, it will subsist only as federation of strong, small local communities. Baseball is supremely federal, in the best of ways. Take for instance, my Iowa Cubs. In a little ballpark, in the mid-sized, middle-American city of Des Moines, we have seen Kris Bryant, Kyle Schwarber, David Bote, and even Manny Ramirez up close and personal. In this way, my local community, which holds its AAA team with great affection, is folded also into that broader community in and around mighty Chicago. But the beginnings are found on smaller levels still, in neighborhood parks and middle school fields, at diners and corner bars, and in small-town minor-league games (I once had a lawyer from Chicago tell me that one of the most perfect games he ever watched was in a tiny park in Burlington, Iowa). Baseball, then, might even be a sort of bellwether for the health of our polity, for it lives and breathes on the health of community life. The ability for us to operate as a political community depends on our ability to conceive of ourselves as a society of persons with a fundamentally shared loyalty. Lacking this, politics tends increasingly toward exertions of power, where identity groups seek to defeat and destroy their opponents by force. In order for a shared identity and loyalty to exist, it must be felt as a lived reality, and not as an abstraction or an imposed ideal—it relies on shared life and relationship in particular communities, and the shared life of those communities with one another. Baseball, for Americans, is a piece of this social fabric without which the country would rend itself in pieces. Baseball is healthy when that fabric is healthy, and we should concern ourselves with how best to ensure that each of the threads is strong. Churches, the arts, small businesses, and local government are all wrapped together with our national pastime in the web that, up to now, has kept us from fully coming apart. Are We Good Enough for Baseball? Baseball viewership is down. A few years back, the Giants-Royals World Series pulled in fewer viewers than an average regular season NFL game. The leadership of the sport, journalists, and media execs fretted, and continue to fret, about the pace of play, marketing, and rule-changes, but perhaps they ought to be fretting about something larger. Perhaps this drop in baseball’s following indicates a problem with the community infrastructure that nourishes the sport on the level of family, school, and neighborhood—perhaps it’s a sign that many of us are becoming more alienated and lonelier. Baseball is, after all, typically passed on in some way as a parental inheritance, whether that is your dad teaching you to throw or hit, or your mother taking you and your friends to the ballpark on a Sunday. The sport lives best when family, block, neighborhood, and city are strong. Maybe we should be concerned, not that the game is too slow, but that we have grown too impatient to appreciate it. I don’t know. If people want their senses to be tickled by fast-paced action, they have a million ready alternatives. The market is flooded with frenetic entertainment to distract the restless soul. Baseball’s enduring appeal lies deeper than this, and it shouldn’t be diluted for a mess of porridge. The solution? It is very, very easy. Take a friend to a baseball game, take your daughter and son, your nieces and little nephews. Join a league or get some friends to play at the middle school field. This is all it takes—the game will do the rest. Nathan Beacom is a native Iowan living in Washington, D.C. He is a fan of the Chicago Cubs.